All this means that 2, 190 beds have been released over 15 months, which is a huge achievement. To put the number in context, that is more beds than in any Acute Trust in England – more beds than in any single hospital in Central Manchester, Leeds or London. But it is not just the number that is impressive, it is the scale of the challenges that have had to be overcome to achieve it. Two of them particularly stand out. 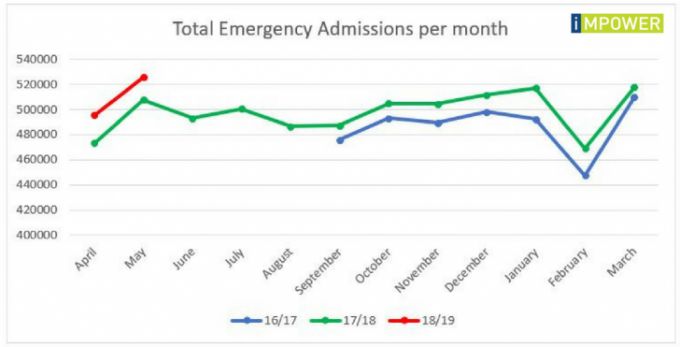 Firstly, the reduction in delayed days has been achieved despite the fact that emergency admissions continue to rise – in May, they were up 3.5% on the same time last year. The ability of both the NHS and local authority departments of social care to process this rising demand has clearly improved. In fact, had demand remained static at the same level as May 2017, we would now have a national DTOC rate of 9.79 days per 100,000 population, almost at NHS England’s target of 9.4 days. The field of play for dealing with DTOC is health AND social care, not two separate pitches with simultaneous games. The players on the pitch (in other words the main focus of our attention) should be the people accessing health and care services, not the organisations themselves. DTOC can only be solved if we take a cue from Gareth Southgate and look holistically at our players’ needs. The primary aim of the game is to keep the players on the pitch – living independently and out of hospital – rather than just processing people out of hospital as quickly as possible. Injuries are possible, but care and attention should be paid to ensure that players don’t end up in an endless cycle of re-admissions to hospital. Securing a World Cup victory over DTOC relies on us reframing the way we think about the problem. Health and social care leaders need to establish an inclusive ambition which goes beyond processing people out of the back door of hospitals.